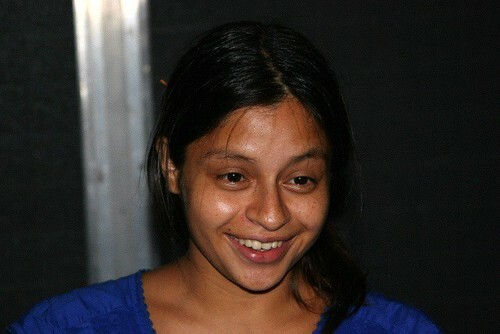 Since last night, I have been rejoicing because Lilly Aramburo was (finally!!) featured on Nancy Grace as a Case Alert! Perfect timing too, as October is Domestic Violence Awareness Month, how appropriate and amazing! Check out the video and PLEASE share it with all your friends on networking sites like Myspace, Facebook & Twitter. Social media can be used for good; this is your chance to be helpful & selfless for the benefit of a child who misses his mother and deserves to know the truth. 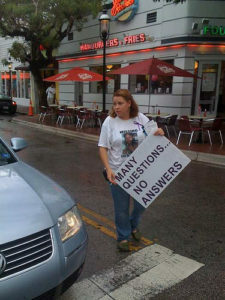 GRACE: “Case Alert,” the search for a young mom vanishing, Miami, Florida, 24-year-old Lily Aramburo reported missing June 2007 from a condo she shared with a live-in. According to reports, since her disappearance, the condo has been found desolate, full of trash, appliances missing. She`s 4-11, 108 pounds, black hair, brown eyes, tattoo lower back. If you have info, call Miami-Dade police, 305-418-7200. We ask everyone to continue the awareness campaign. You can make a huge difference! 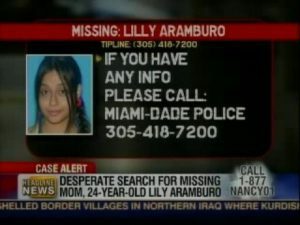 Lilly deserves justice and that is why I am asking you to contact Nancy Grace and ask her to investigate Lilly’s disappearance. Thank you for all of your support! And special thanks to Levi from War on Crime for making this happen!! =) Nancy, THANK YOU!